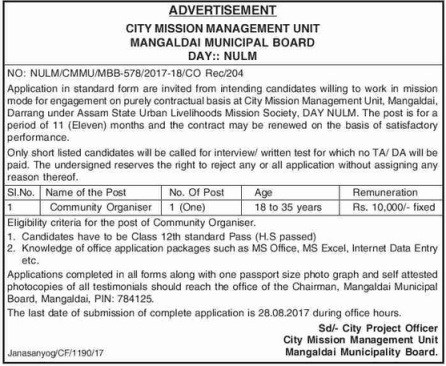 Application in standard form are invited from intending candidates willing to work in mission mode for engagement on purely contractual basis at City Mission Management Unit, Mangaldai, Darrang under Assam State Urban Livelihoods Mission Society, DAY NULM. The post is for a period of 11 (Eleven) months and the contract may be renewed on the basis of satisfactory performance. 2. Knowledge of office application packages such as MS Office, MS Excel, Internet Data Entry etc. How to apply: Applications completed in all forms along with one passport size photo graph and self attested photocopies of all testimonials should reach the office of the Chairman, Mangaldai Municipal Board, Mangaldai, PIN: 784125 before 28-08-2017.